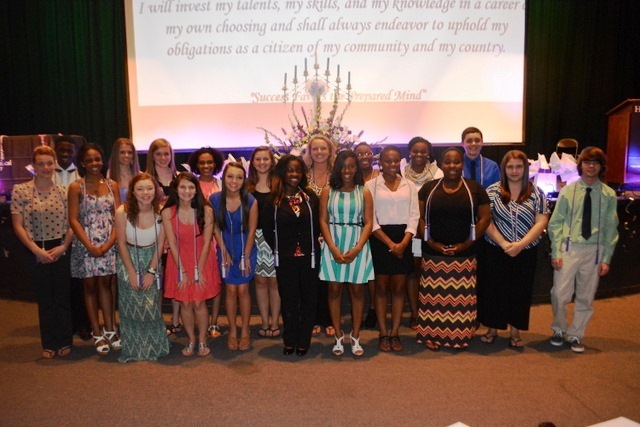 The Scotland County Schools Career and Technical Education Department held its first National Technical Honor Society (NTHS) induction ceremony on Thursday, April 3, 2014 in the auditorium at Scotland High School.Twenty-two juniors and seniors met the requirements for membership. Students recognized as NTHS members are those who have excelled in both their technical area courses and their required academic classes. In order to be nominated, students must have a 3.0 unweighted overall GPA as well as a 3.25 unweighted average in their CTE classes. Students must also have recommendations from two of their teachers to be considered for membership. The ceremony included guest speaker Tonia Stephenson, President of the Laurinburg/Scotland County Chamber of Commerce, remarks by students Logan Wagner (HOSA) and Maya Addai (FBLA), with special entertainment from Samantha Ray, CTE Digital Media Instructor. 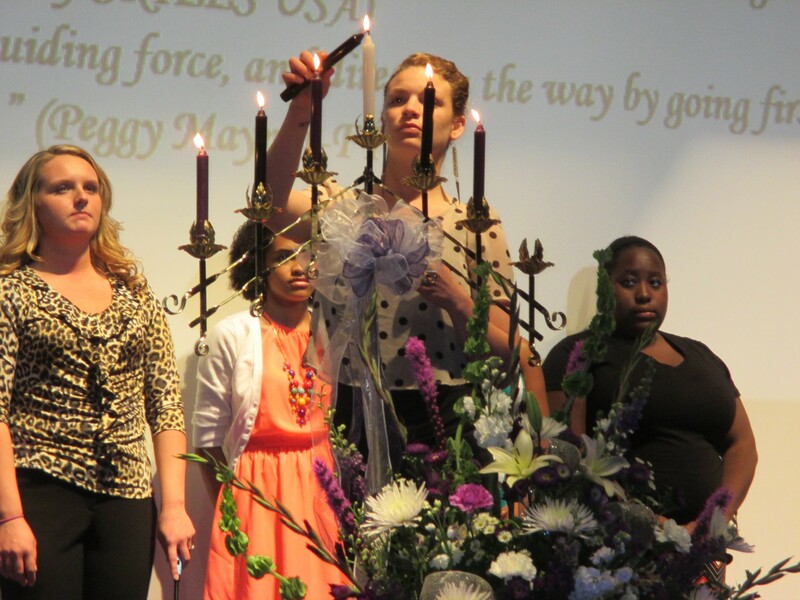 After the candle-lighting ceremony, inducted students received a certificate recognizing their achievement as well as a NTHS honor cord which they then wear with their cap and gown at graduation. Inaugural members were: DECA-Brittany Evans, Danazshia Hines, Jazzmine Pratt, E’Yana Rogers; FBLA-Maya Addai, Ashley Barringer, Amara Cromartie, Shaunee’ McLaurin; HOSA-Gianna Bell, Yasmine Bell, Anna Lisa Ciarrocca, Kayli Graves, Roxanna Gualtier, Havanna Holfert, Taylor Lossman, Emily Peele, Alexis Scott, Matthew Sellers, Logan Wagner; SKILLS USA-Juaneisha Terry. The National Technical Honor Society serves about 200,000 members and awards more than $160,000 in scholarships to its members every year. For more than 30 years, NTHS has been the acknowledged leader in the recognition of outstanding student achievement in career and technical education.